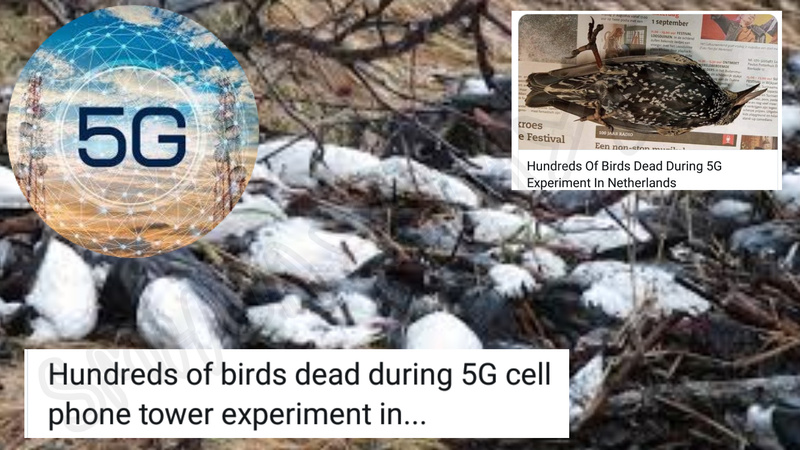 A message claiming that 297 birds died in The Hague, Netherlands due to high frequency radiations caused during 5G tests is going viral on social media. According to Hague’s municipal government, on 19 October 2018, a series of mysteriously dead birds was found dead at a Huijgenspark in The Hague. This continued till 3 November 2018 and more than 300 birds were found dead. According to SNOPES, Erin Elizabeth’s Health Nut News reported the event and wrote a ‘medical conspiracy blog’ titled “Hundreds of birds dead during 5G experiment in The Hague, The Netherlands” on November 5. It noted that the blog is just a compilation of series of Facebook posts by a man named John Khules who is associated with running several anti-5G conspiracy websites and social media pages. “This is a hoax. The birds were probably poisoned but the tests are still being carried out.” the Dutch News Editor, Robin Pascoe said while talking to the QUINT. The news is false as the relationship between the two incidents, 5G radiations and the death of birds does not evidently exist. After this mass death incident, the local government has put in place a temporary dog ban. It is alleged that the birds died due to consumption of some poisonous substance. Research and tests are being carried out in order to check the traces of poison, as confirmed by Pascoe. It is evident from reports and studies done by numerous organizations, including the US Health Department, on the harmful radiations from cellular devices which can cause cancer, tumor in heart and other health issues and severely affect human beings. In the light of Rajinikanth starrer 2.0, which shows the ill-effects of cellphone radiation on birds and bees, this fake message holds significance as it can easily influence the masses. ← Turkey’s highway photo is viral claimed as Mumbai-Goa NH66. Don’t Spread LIES, Check Facts First !